The Walt Disney Company's animated films are almost universally lauded as wholesome family entertainment, enjoying massive popularity among children and endorsement from parents and teachers. Mickey Mouse Monopoly takes a close and critical look at the world these films create (in terms of the stories told about race, gender and class) and reaches disturbing conclusions about the values propagated under the guise of innocence and fun. Mickey Mouse Monopoly takes a close and critical look at the world these films create and the stories they tell about race, gender and class and reaches disturbing conclusions about the values propagated under the guise of innocence and fun. This daring new video insightfully analyzes Disney's cultural pedagogy, examines its corporate power, and explores its vast influence on our global culture. 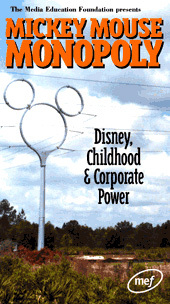 Including interviews with cultural critics, media scholars, child psychologists, kindergarten teachers, multicultural educators, college students and children, Mickey Mouse Monopoly will provoke audiences to confront comfortable assumptions about an American institution that is virtually synonymous with childhood pleasure. Interviewees include Henry Giroux, Diane Levin, Gail Dines, Elizabeth Hadley, Carolyn Newberger, Alvin Poussaint, and Justin Lewis.